The Tolino Vision 4 HD is the best e-reader to come out of Europe, ever. It takes the best elements of the Amazon Kindle Voyage and the Kobo Aura H2O Edition 2 and gives users a solid experience. The Tolino is waterproof/dustproof, has the same RGB front-lit system as Kobo and the screen is completely flush with the bezel. The Vision 4 HD features a six inch E Ink Carta display with a resolution of 1448X1072 and 300 PPI. The screen is completely flush with the bezel, which makes interacting with the touchscreen a joy to use. 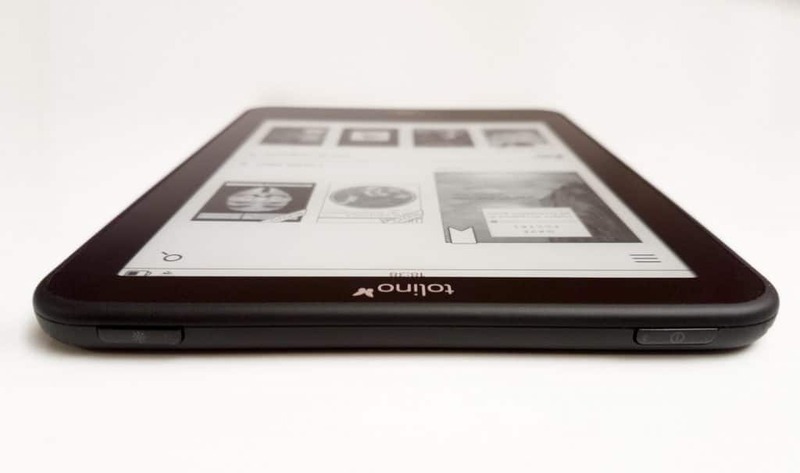 This is the second model in the world to feature a different lighting system, which is comparable to the Kobo Aura One. 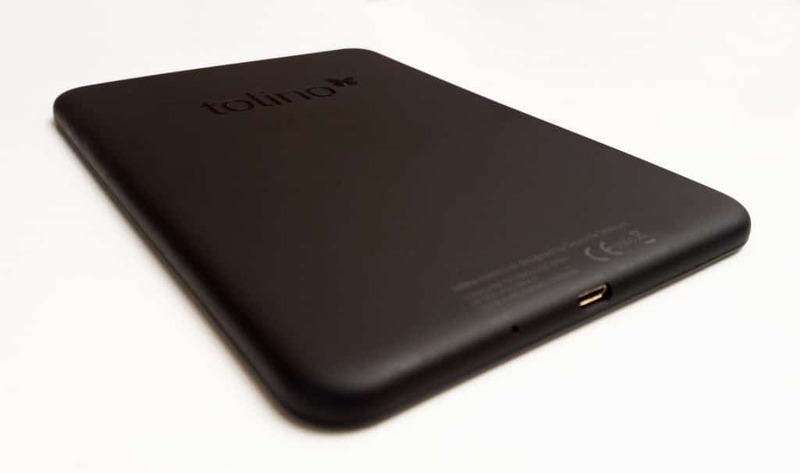 Tolino bills it as a “Color Temperature Light” and although it is not as advanced as the Kobo model, people seem attracted to this feature for reading a night. It is also waterproof and dustproof. Underneath the hood is a Freescale IMX6 single core 1GHZ processor, 512MB of RAM and 8GB of internal storage. There is no SD card to expand the memory further, but it does have 5GB of Tolino Cloud Storage. You should get around two weeks of usage with the 1500 mAh battery. The Tolino Vision 4 HD has a feature called Tap to Flip. 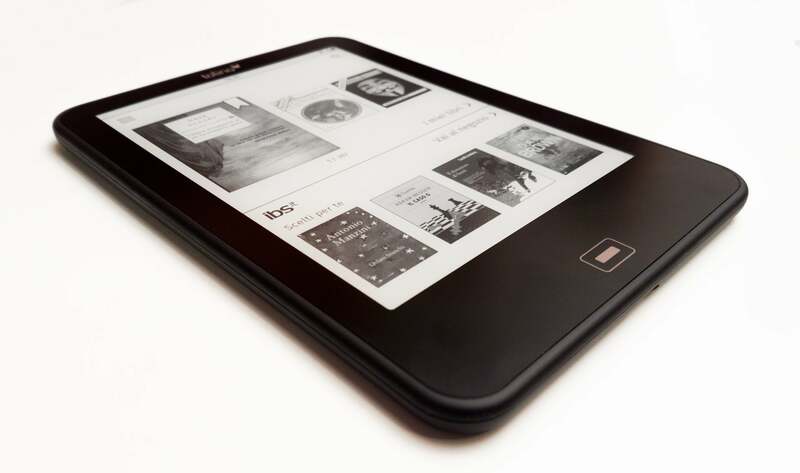 The entire rear panel reacts to the fingertips and can be used to turn the pages of an e-book or navigate around the e-reader. There is a vibration sensor can be turned off in the settings menu. There is a capacitive touchscreen button on the front of the screen that brings you back to the main menu when you press it down. There is a settings page on the top left hand side that allows you to access WIFI, firmware updates and an Adobe setup area, where you can enter your login and password so you can sideload in library books or ebooks you purchased from other retailers. The UI of this device is very clean and does not have slew of features that will confuse new users. The home screen includes your library, with the last three e-books you have opened. There is also a small carousel at the bottom of the screen that showcase new and notable titles from the Tolino bookstore. You can set this device in many different languages, including English, French, Spanish, Italian, Dutch, and German. Whatever language you employ will totally change the menu options and the entire user interface. There is an internet browser and the navigation experience is really solid. Many websites these days are optimized for mobile, which is a boon for e-readers. This e-reader is sold in Germany, Belgium and a number of other countries. Our review unit was bundled with the Hugendubel bookstore, but this is not the only one you are stuck with. There is a new feature on the Vision 4 HD called Library Link. You can link your existing account with retailers such as Thalia, Orell Fussli, Weltbild, IndieBook, Buch, Libris and many others. Once your accounts are linked, you can import in all of the e-books you bought from that specific retailer and they will be available to read in your device’s library. 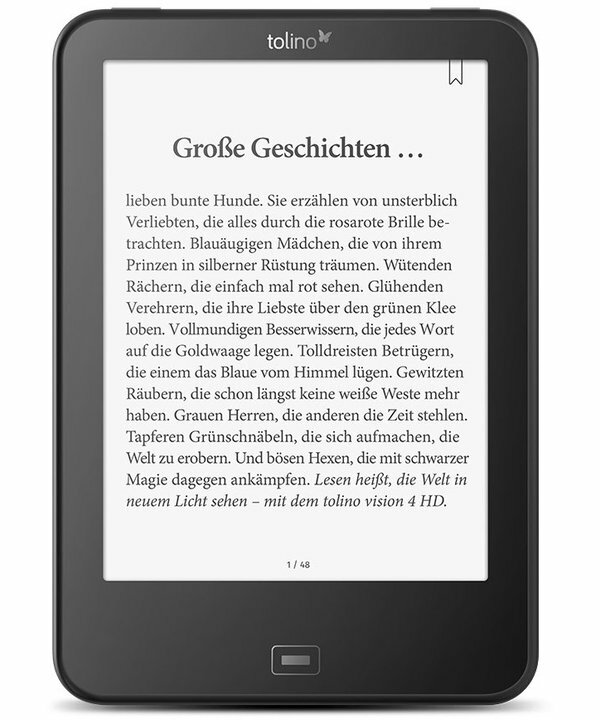 This is the first e-reader in the world that plays nice with all of the German booksellers. The overall reading experience is very solid. Changing the fonts, font size and alignment is very similar to the experience that Amazon provides. You have Bitter, Fira Sans, Source Sans, Publishers Font, Droid Serif, OpenDyslexic and Vollkorn as the stock fonts. There are three different settings to augment the line spacing, alignment and margins. There are many dictionaries that allow you to lookup a specific word or you can install a translation dictionary. There are dozens to choose from, such as German to French, German to English, English to French and so on. The E Ink Carta screen makes page turns super fast and responsive. You can tap on the page to turn, swipe/gesture or use the Tap to Flip feature that is on the bottom of the e-reader. The RGB lighting system is not as refined as the Kobo. In a side by side comparison during our review video you can really use how muted the colors on the Tolino, while the Kobo is bright and vibrant. If you are not using the RGB color mode, the default front-lit display is on par with Amazon and Kobo. The Tolino Vision 4 HD is a tour de force. It offers a myriad of features not found on other e-readers and the company has not been afraid to innovate and try different things. is the software less glitchy than Kobo? by miles. Although opening the store was kinda glitchy. I’m in Australia, and this looks perfect. I’ll keep an eye out, but the usual suspects don’t ship (yet at least). It looks a little chunky? Are there any dimensions for it? Nice review, but you you haven’t pointed out one of the most relevant weakness of this device: the underlining function. It’s quite well known on the web that, in this device, the underlining function is not so good as in the Amazon’s devices. So what can you say about that? It’s a real nightmare. I can promise you. I didn’t know it was “well known”, in just getting so mad, it’s IMPOSSIBLE, I’m losing a LOT of time to underline, I’m to the point that I don’t care anymore that’s waterproof, why making something waterproof (advanced function) if it’s not even able to make the most BASIC things like underling? I’ve found this article because I was using the Tolino and was thinking “thin thing can’t be normal, it must be broken, I can’t believe that this is how such an expensive reader is supposed to work, I’m going to search if other people had the same problem and if not I’ll write to the support to have it fixed”. And, voilà, it’s a damn well known problem which I didn’t know before buying! I’m going to try to return this crap. They must fix this or give me my money back! I’m coming to Australia, I can show it to you and if you can live with the underlining function I’ll sell it to you. Mint condition, almost never used. Write me a PM. It’s my first reader. Please tell me there is something better. If this is the least glitchy, I’m out of the market. Turning pages quick? Are you kidding? And underlining! I’m needing a session of relaxing massage after using this to learn, because the underlining is driving me crazy, it’s the least responsive piece of thing which I’ve EVER used since Commodore 64! Please give me an alternative, I don’t care the price, tell me please which reader has got 8gb or SD expanding, and it’s faster than this thing, in turning pages, in underlining, in everything. I need something fast. This seems to have the processor of a smartphone of 10 years ago! 1. Does it allow to select / highlight text over multiple pages at once?